Transforming your bathroom into a place of escape, recharge and relaxation is a huge trend in the home improvement market. The traditional bath and vanity fixture isn’t disappearing any time soon due to is functionality. However, there are new ways to beautifully illuminate your bathroom. Here are 5 unexpected bathroom lighting solutions that you don’t normally see, but ones that still provide the function that you desire. 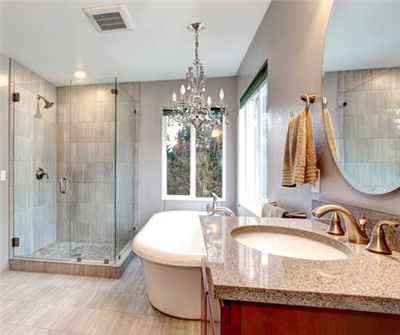 Adding lighting elegance into your bathroom can be done seamlessly with a statement chandelier. Some homeowners choose to place this piece over the dual sink. Not only will this add glamour but it is a functional way to add another source of lighting to your bathroom’s design. Placing a chandelier above the tub creates the perfect atmosphere for a relaxing bath to help you to unwind after a long and stressful day. Pair this with a few candles and sconces to create the ultimate retreat. This unexpected lighting solution adds sophistication and will take your bathroom to the next level. Spaces with high ceilings can be a problem as traditional lighting may cast shadows that make the space feel dreary. Bring the light down to an appropriate level by adding pendant lighting in your bathroom. Designers in 2015 have been accentuating a variety of areas with this unique lighting solution. Adding pendant lighting over a soaking tub can create a relaxing space. Pendant lights on the side of bathroom mirrors can be an attractive way to functionally light this space. There are so many possibilities for these small, yet useful lights! A decedent way to light your bathroom is with the use of recessed lighting fixtures. Many homeowners have opted to add recessed lighting in their shower areas. This can be a very energy efficient way to light your bathroom, and it is aesthetically pleasing. Adding this subtle, yet beautiful lighting option to your bathroom takes up far less space than traditional lighting. Don’t miss an opportunity to make your bathroom lighting more stylish with these appealing lighting tips. Using one simple light on the ceiling of your bathroom is a thing of the past considering there are so many lovely options for lighting your modern bathroom.